Nonsteroidal anti-inflammatory drugs (NSAIDs) provide strong anti-inflammatory and analgesic effects without the adverse effects associated with corticosteroids. These drugs have associated cardiovascular and gastrointestinal risks when taking them. NSAIDs includes propionic acids, acetic acids, fenamates, oxicam derivatives, and cyclooxygenase-2 (COX-2) inhibitors. They differ in chemical structures but NSAIDs are clinically all-inclusive. Acetaminophen is a related drug which has antipyretic and analgesic properties but does not have the anti-inflammatory effects of the salicylates or the NSAIDs. Etiology is not precisely understood but most symptoms can be attributed to the action of uterine prostaglandin, PGF2a. This stimulates uterine contractions, ischemia, and sensitization of nerve endings. Prevalence rate is as high as 90 percent and is common among younger women. Some cases are adequately provided relief by OTC NSAIDs. Inhibition of prostaglandin synthesis thereby exerting its anti-inflammatory, analgesic, and antipyretic effects. It blocks two enzymes, namely cyclooxygenase (COX) 1 and 2 present in all tissues and seems to be involved in many body functions, like blood clotting, stomach lining, and sodium-water balance in the kidney. COX-1 turns arachidonic acid into prostaglandins as needed. COX-2 is active at sites of trauma or injury when more prostaglandins are needed. Therefore, NSAIDs block inflammation before all of the signs and symptoms can develop. Acetaminophen, a related agent, acts directly on the thermoregulatory cells in the hypothalamus to cause sweating and vasodilation causing release of heat. The mechanism related to analgesic effects has not been identified. Acetaminophen, a related agent, is used to treat moderate to mild pain and fever in children and often used in place of the NSAIDs or salicylates. It is found in many combination products and can cause severe liver toxicity that can lead to death when taken in high doses. Acetaminophen is also used in treatment of influenza, for prophylaxis of children receiving diphtheria-pertussis-tetanus (DPT) immunizations, and for relief of musculoskeletal pain associated with arthritis. T1/2: -1.8 – 2.5 hrs. Allergy to NSAIDs or salicylate. Prevent adverse effects. Allergy to sulfonamides. Contraindication with celecoxib. Peptic ulcer or known GI bleeding. Potential to exacerbate GI bleeding. Pregnancy or lactation. Potential adverse effects on the neonate or mother. Renal or hepatic dysfunction. Can alter metabolism and excretion of the drug. Any other known allergies. Indicate increased sensitivity. 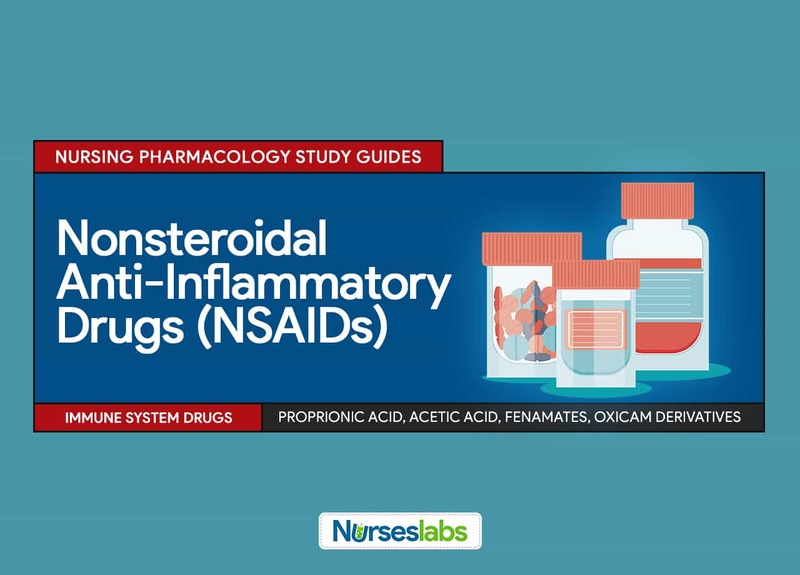 Nursing considerations in patients taking NSAIDs are the same as that of patients taking anti-inflammatory agents. Nurse Kate is taking care of patients taking ibuprofen. Which of the following should be included in her assessment and monitoring? NSAIDs are associated with CV (hypertension) and GI (constipation, diarrhea, etc.) adverse effects. All other options are not related. Upon checking the medication chart, Nurse Mike found out that his patient is taking both acetaminophen and furosemide. Which of the following interventions is an appropriate nursing action for these two drugs? Administer medications as they are because they enhance drug actions. Measure patient’s intake and output closely. Acetaminophen can decrease the diuretic effect of loop diuretics so it is important to monitor patient for fluid retention. Which of the following patient manifests acetaminophen toxicity? Acetaminophen toxicity manifests as severe hepatotoxicity. Which enzyme is found in active sites of trauma or injury? The presence of this enzyme in active sites of trauma prompts increase in prostaglandins. NSAIDs block COX-2 before signs and symptoms of inflammation can develop. Onset of action of IV NSAIDs is immediately after infusion. In oral form, onset is 30 minutes after administration. Which of the following NSAID pairing is correct? Ibuprofen is a propionic acid and indomethacin is an acetic acid. 1. Nurse Kate is taking care of patients taking ibuprofen. Which of the following should be included in her assessment and monitoring? 2. Upon checking the medication chart, Nurse Mike found out that his patient is taking both acetaminophen and furosemide. Which of the following interventions is an appropriate nursing action for these two drugs? A. Administer medications as they are because they enhance drug actions. B. Measure patient’s intake and output closely. C. Arrange for SGPT monitoring. D. Assess for signs and symptoms of bleeding. 2. Answer: B. Measure patient’s intake and output closely. 3. Which of the following patient manifests acetaminophen toxicity? 4. Which enzyme is found in active sites of trauma or injury? 6. Which of the following NSAID pairing is correct?